One week after toppling then-No. 5 Stanford behind an unusually powerful passing attack, the Trojans returned to a ground-and-pound strategy headed by redshirt sophomore running back Javorius “Buck” Allen on Saturday night to beat Colorado 47-29. USC (9-3, 6-2 Pac-12), however, was still eliminated from the Pac-12 South division title race as Arizona State defeated UCLA 38-33 to clinch its spot in the conference championship game versus Stanford. The Buffs (4-7, 1-7) managed to put up 22 points and double the team’s total yardage in the fourth quarter to make the final score close. 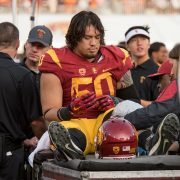 But an onside kick recovery followed by a 52-yard touchdown scamper by redshirt sophomore fullback Soma Vainuku put the finishing touch on the Trojans’ fifth straight win, and improved their all-time record against the Buffs to 8-0. 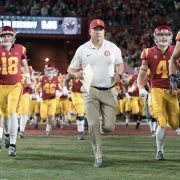 Now, it seems next week’s matchup against the Bruins will only determine which rival can claim bragging rights for the next year, as well as possibly define the coaching future of Orgeron, who has guided the Trojans to a 6-1 (6-0 in the Pac-12) record after taking over for former head coach Lane Kiffin. The chilly temperature would seem to help Colorado, given that in school history, the Buffs had been 11-1-1 at home in sub-30 degree weather while USC hadn’t played in those conditions since 1959. But the Trojan defense was up to the task, as most of the starters left with a 37-7 lead midway through the third quarter, with the lone Colorado touchdown coming off a fumble return. Colorado didn’t run a play in USC’s territory until the 2:40 mark of the second quarter -— and that play resulted in an interception. The Buffaloes’ 63 first-half yards were a season low, as Colorado was shut out in the first half for the first time this year. The Trojans did an excellent job of blanketing Colorado wideout Paul Richardson, who came in as the fourth-leading receiver nationally (120.1 receiving yards per game) but netted only 88 yards against USC, all of which came in the second half. His first reception came more than halfway through the third quarter, when USC was up 37-7 and the game was well out of hand. Neither senior tailback Silas Redd (knee) nor junior wideout Marqise Lee (shin) traveled with the team due to injuries, but the Trojans were just fine on offense without them. Kessler was his usually efficient self, completing 19 of 28 passes for 184 yards and two touchdowns before sitting out the fourth quarter with a healthy lead. Allen continued to showcase his explosive talent, amassing 169 all-purpose yards (145 rushing) and three touchdowns on 21 carries and three receptions. The former fourth-string tailback had his third three-touchdown game this season, and has tallied 619 rushing yards and 10 scores (nine rushing) in the last four weeks. Allen put the Trojans on the board with an impressive 12-yard touchdown run, taking an outside handoff to the sideline before stretching to touch the pylon. 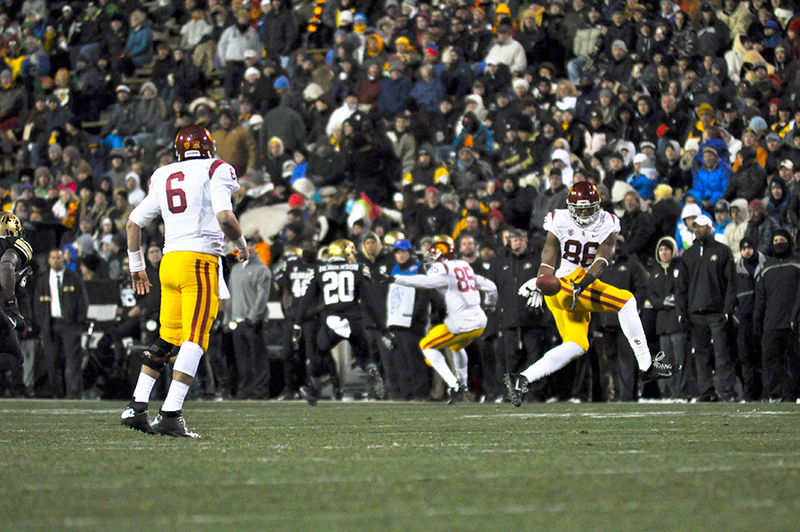 After USC’s defense pinned the Buffs deep in their own territory, Vainuku came up with his third blocked punt of the year. The ball spun out of the back of the end zone for a safety to put the Trojans up 9-0 with just more than a minute left in the first quarter. The Trojan defense pressured Colorado freshman quarterback Sefo Liufau all night long, letting the freshman complete just four of 15 passes in the first half. 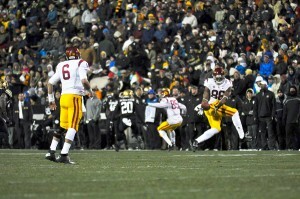 And it paid off midway through the second quarter after USC’s offense had started to lull. Sophomore defensive end Leonard Williams came up with his sixth sack of the year, forcing a fumble that the Trojans recovered for great field position at the Colorado 20-yard line. Allen punched it in from one yard out a few minutes later to give USC a 16-0 lead. 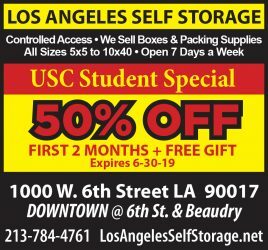 Earlier in the week, Bailey had said that Liufau tended to “make a lot of freshman throws — overthrows, underthrows, misreading things.” Bailey backed up his talk, coming up with an interception with just more than two minutes left before halftime to preserve USC’s first-half shutout. From there, the Trojans drove 66 yards in less than two minutes to reach the end zone again before halftime. Sophomore wide receiver Nelson Agholor reeled in a 20-yard back shoulder throw from Kessler to extend USC’s lead to 23-0 heading into the locker room. It briefly looked as though Colorado would make a push after the Buffs returned an Allen fumble 33 yards for a touchdown on the first play of the second half. But the Trojans responded with a 7-play, 75-yard drive punctuated by a 10-yard touchdown pass from Kessler to redshirt junior tight end Randall Telfer to reinstate its 23-point cushion and let them cruise to the finish line.